R. John Buskowiak found life in camp very much to his liking. The long days, hard work, and living out of a trunk were compensated by good food, good friends, and the many recreational and educational amenities available to Corps workers. You see in the C.C.C. 's we were under the control of the army when we were in camp and under the control of the S.C.S. (Soil Conservation Service) when we were working in the field. 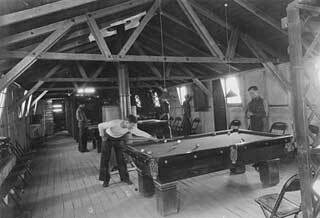 Our typical morning started about 5:00 A.M. We had four barracks at Plainview, about 50 boys to a barrack. There were about 200 boys more or less to each camp. On the camp grounds were also a hospital, a latrine, a laundry house, a mess hall, a recreational hall with a canteen in it (to buy cigarettes, ice cream, and toliet articales) a large garage for our trucks and cars of the government. Also there was school house where boys who did not go to High School could take some subjects like drafting and surveying. Each morning we got up all of us 50 boys would mop out our barracks. Then we would go to the latrine and shave and dress up in our best sun tans with our skull cap on and we would all be brought to attention beneath the flag pole. There we would have calisthenics for a half hour and then salute the flag as it was being raised by the playing of the bugle. We would then have breakfast, then go back to our barracks and change into our work clothes. We then would pick up our lunch and go to the garage where we would be transported to our work in army trucks. Our work day started at about 8:00 and we would get back into camp about 4:30 P.M. Then we would take a shower and put on our best sun tans and again gather under the flag pole to stand at attention when the flag was again lowered by the sound of the bugle. After we had our evening meal we could have the time to ourselves. This was the time when we could gather up our dirty clothes and get them ready for the laundry the next day. It was a time when we could sit down and write a letter to Mom or to our sweetheart who was waiting for us. It was a time when we could relax over at the canteen eating some ice cream and joking with the boys. I think the lights went out at 10:00 P.M. It may have been 9:00 P.M. but I'm almost sure it was 10:00 P.M. They had bed check every night to make sure we were all in our beds. Some evenings of course we could go down town and would have to get a pass to do this. Some weekends we could get a pass to go home but not too often. Every evening when the sun went down the taps were played. I don't know of anything that brings on lonesomness more than hearing the taps at sun down. Here I was just a boy of 16 with other boys as old as 25. I just loved it. The discipline, the orderly fashion which our lives were managed and the meals were very good. We had scrambled eggs and bacon every morning or dried beef on toast (we had our own name for dried beef on toast but I can't say it here) and for lunches we had large bologna or summer sausage sandwiches with cake or cookies (we also had our own name for bologna and summer sausage but again cannot say it here). 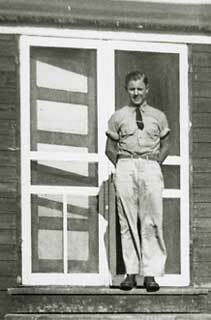 John Buskowiak, wearing his best sun tans, CCC Camp at Plainview, 1938. Civilian Conservation Corps Camp, Plainview, 1938. 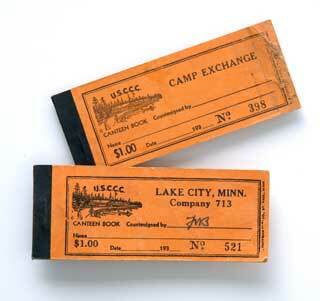 CCC Canteen Book, Lake City Co. 713, 1940. 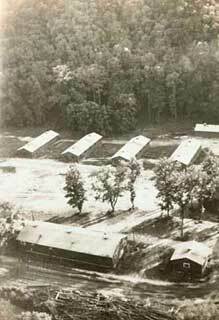 Photo: Rec Hall, CCC Camp 4727, Rice Street and County Road G, Vadnais Heights[? ], 1937. 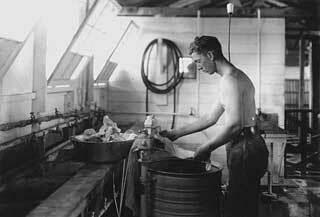 Photo: Laundry, Civilian Conservation Corps Camp 4727, Vadnais Heights(? ), 1937. 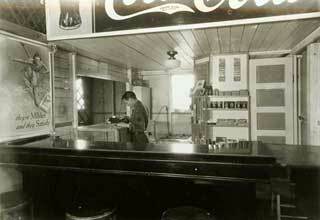 Photo: Canteen, CCC Camp 4727, Rice Street and County Road G, Vadnais Heights[? ], 1937.